Children kill each other on telly in a well-acted but otherwise familiar SF action drama. Reading anything about the film adaptation of Susanne Collins‘ popular novel of the same name reveals a familiar set of references. Its resemblance to both the book and film of Battle Royale, its resemblance to the short story “The Lottery” and numerous other humans-hunting-humans films – Death Race 2000, The Most Dangerous Game, Turkey Shoot. It’s a long list, and it takes some oomph to do it well again. The story set-up is the usual futuristic, post-war division of society with rich winners and destitute losers. Here, the rich offer the poor a way out by randomly choosing young boys and girls to fight each other to the death for the entertainment of all. Katniss Everdean volunteers for the games to save her chosen little sister from a certain fate. 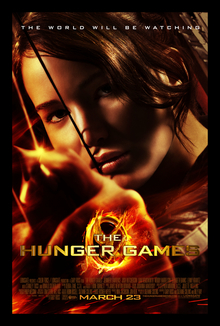 A skilled hunter with a reason to win beyond the riches escape and victory promise, Katniss is played with some depth by the excellent Jennifer Lawrence, supported by Woody Harrelson as a former winner turned trainer, as well as good turns from Wes Bentley and, surprisingly, Lenny Kravitz. The quality acting really saves The Hunger Games because, alas, there’s not a lot else going on. By falling into that SF chestnut (i), the divided, dystopian society, the makers (let’s not single any one individual out) approach their vision so heavy-handedly it’s embarrassing. The well-to-dos flaunt themselves in garish, OTT costumes and make-up – imagine an entire city populated with Chris Tucker from The Fifth Element – and eat fine food. Meanwhile, the struggling poor in concentration camp-stylee clothes, living in a permanent grey, survive off of scraps and barter. Cue SF chestnut (ii), where a violent game keeps the urges of the masses checked. Administration of this televised game is borrowed wholesale from The Truman Show, with Wes Bentley in the Christof role, manipulating events to produce better entertainment. This approach is particularly knuckle-headed in that the two big FX set pieces in the film – a forest fire and a big doggy attack – don’t make sense. If the show is about watching the kids kill each other, why generate events that could result in their deaths? The controllers of the game are also incongruous. You can just about buy all the overdressed, affected, made-up rich types enjoying the bloody spectacle screened in a Roman gladiatorial sort of way, but the “normal” folk working at the TV station where the programme is made are just so that – normal. Not crazily dressed, not eccentric in any kind of way. So matter-of-fact, that it defies credibility that not one of them might question what they do, or at least show some hint of discomfort. They are, after all, accessories to the murder of children. And don’t get me started on the dubious gifts that get parachuted into the game to assist players. Pah. Only worth your time if you are a fan of the books or cast. Otherwise, The Hunger Games will leave you… (I hate this bit..) starving. William Levy To Join ‘The Hunger Games’ Cast For Third Installment? 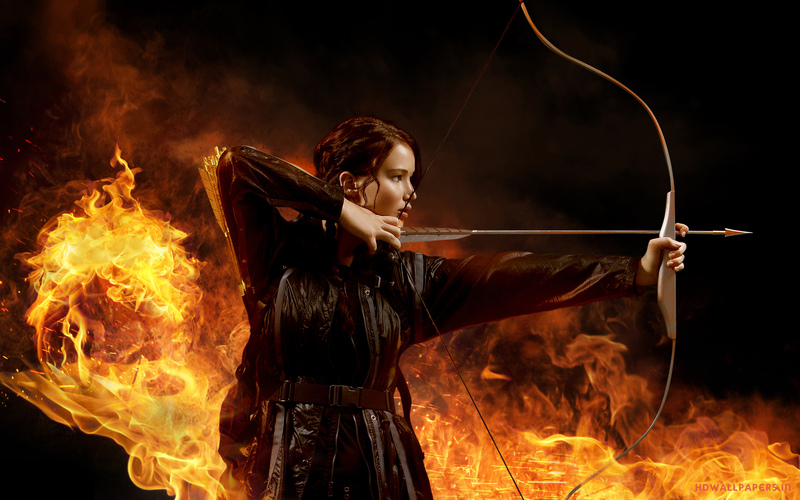 Jennifer Lawrence: ‘Hunger Games Catching Fire’ Poster!